18th July 1980 - 0 months Ordered from M.L.P. Hartswell Ltd Mazda in Plymouth by Mr J Kingdom. It seems strange that a brand new MG was ordered through a Mazda dealer, who had it registered with the local MG dealer on delivery. However, looking at the first service invoice suggests this may have been a company car, and perhaps it was ordered from the same place as other cars. The order included �0 of accessories, I'm not sure what they were exactly, but some or all of that went towards ServoGlide electric windows and Ziebart Rustproofing. The electric windows are fantastic, they have magnetic access covers and an emergency crank handle kept in the glovebox should power fail. Obviously cutting edge! The service was booked by J&M Tailoring Ltd, which is where I get my suspicion that this was a company car. This service was booked by Mr J Kingdom, so it was still in his hands, so I wonder if he was the J in J&M Tailoring. Note the service was a bit late! 4th November 1980 - 3 months Only 3 months old and she changes hands. Now registered to Elizabeth Whitaker, Elburton, Plymouth. Ms Whitaker also complained that the o/s/f 1/4 window glass was loose in frame, so the total cost was �.44. The MG appears to have been off the road for some time, only 2,148 miles covered in the last 7 years, although it remained registered to Ms Whitaker. This is my father. He purchased the car with the aim of using it if he retired and returned to live in the UK (he lives in Switzerland). It was stored in a garage next door to his sister's house, only venturing out once a month, driven by his brother-in-law to the end of the drive and back to roll the tyres, and once a year for an MOT. 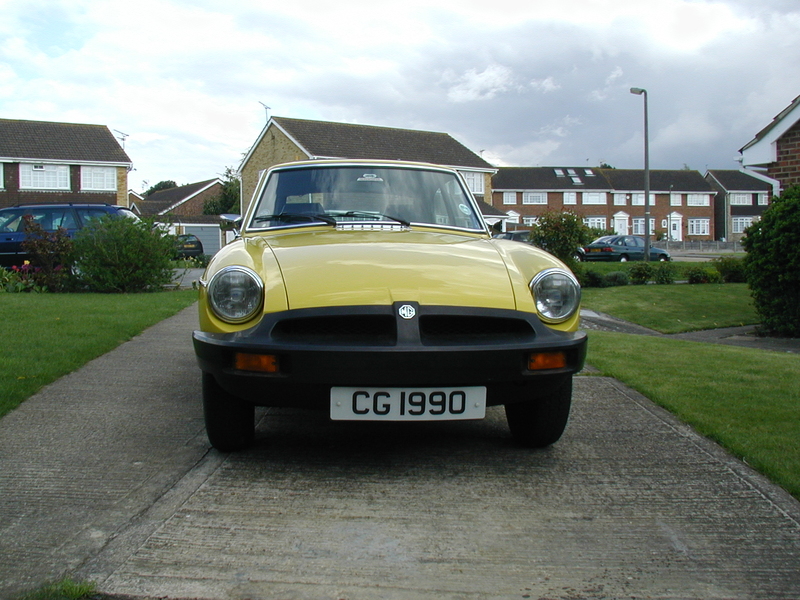 Carried out by The MG Enthusiast - Codmore Hill Garage. This is the last time she was properly run. Soon after, my father's brother-in-law, Norman, passed away. She stayed in the garage after that. Me! Collected by trailer and towed down to Whitstable. Covered up until the garage is cleared out and waiting for me to start work. Full service, with new fuel pump and hoses, new brake hoses and rear wheel cylinders, new battery, new cooling hoses, you name it. She's back to life and being used! Passed with flying colours, as she should considering we only managed 340 miles in the last year. Yes, you guessed it, passed again! Sadly, lack of space, time and money forces sale. She goes away to be cherished and driven.